Working like a . . . well, not really. What do you mean by this word "irony"? asks Micron. I'm a dog and this is how I spend the day in the office. So yes, I actually am working like a dog, thank you. 'Cuz if I were working like a human bean, he continues, I'd be walking around being all blah blah how was your weekend and yadda yada where do you want to go for lunch today. Hey, don't think that it's not like I'm not busy here and not just goofing off. Because I totally am, doncha know. What? I say. Are we doing Bilbo Baggins-speak now? * If I were a dog, my head would be tilting to the right trying to understand what you just said. Lookit, you're as flat a pork chop done on one side. Where's my spatula? Just lift your head up, willya? Naw, I don't think so, says Micron. I already did that once today and I'm not into repeating myself again, because I already did that. Well, at least his eyes are open for this photo. And to his credit, it does appear that Micron has the puppies under control. He is sentinel of all that is yellow puppy. Oh, you want to see a puppy, do you? Well, you have to get past the mighty Micron. Wait. . . did I say get past? I meant trip over. 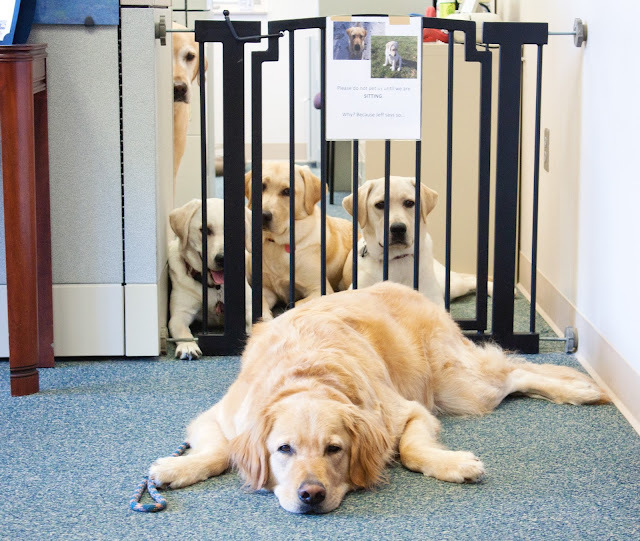 Friday was National Take Your Dog to Work Day, an event started in 1999 by Pet Sitters International. Because my job in the pet food industry is really pretty freakin' awesome, every work day is one I celebrate with a dog, or two, by my feet. I'm a lucky chick, I am. To mark this national celebration however, I took the shot above on Friday. Yeah, yeah, cute dogs and all. But let's take a deeper look here, shall we? In the far back and to the left is Kel, a CCI release and beloved pet. He is not a fan of puppies. Nope, not at all. This is as close as he was willing to come to the front, lest he get puppy cooties on him and require a hazmat decontamination. Also, he's also not willing to stray far from his one true love, Mary Ann (not pictured, but she's right there). And that's our E pups in front. Ever contrary, Euka has one paw outside the dog gate. Hey, Food Lady, says Euka with a smile. I'm on the other side [snicker]. Everett is in the middle and showing off his good-boy behavior. Who's a Good Boy?, asks Everett. That's me! I'm a Good Boy. Euka looks at him with squinty eyes. When Food Lady says Release, says Euka. I am so pouncing on your good boy noggin. And on the right is Ella, who understands where her bread is buttered, so to speak. She's expecting a cookie from me when this is done. I'm good for it and so she's lasered in with those come hither with a cookie eyes. Ella is a smart, obedient girl and how wonderful it would be, I think, that some of that goodness might rub off on Miss Euka. But just like kids, it seems to be the bad influences that win out too much of the time. Poor, kind Everett should be anticipating to be a yellow puppy samwich when these two stinkers pounce him. Oh, and that sign posted on the dog gate? What does that say, you ask? Well, it's there to remind folk to reward our CCI pups with positive attention only when they can show some self-control. ** "Please don't pet us until we are sitting", says the sign. Ok, so we do have on tap more than yellow CCI dogs in some stage of early career development - or forced early retirement, like Kel and Micron. Other co-workers have . . . what's the right word here? Normal dogs? Pet dogs? Rescue dogs? Dogs not on a career path? I dunno, but Nahla is here to show you her ethereal beauty. Nahla, just a young thing, isn't to the stay-here-while-I-take-your-picture stage of life yet. It took me so long to set up this shot that even Micron got bored and left. 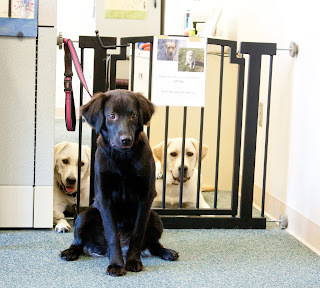 However, I do want to draw your attention to Euka, who is still sticking that paw out of the gated area. With dead on eye contact, the little tart. Why do you keep calling me Stay? My name's Nahla. So if, as they say, everyone gets fifteen minutes of fame, we still have fourteen minutes and some change left. The List, a program aired in the Cincinnati area, was in the office last week to get some footage of our pet-friendly workplace. Before you watch the two-minute clip below, I want to you to know one thing. I don't usually wear flip-flops to the office. But it's not about me, is it? This is, of course, a story about the dogs. 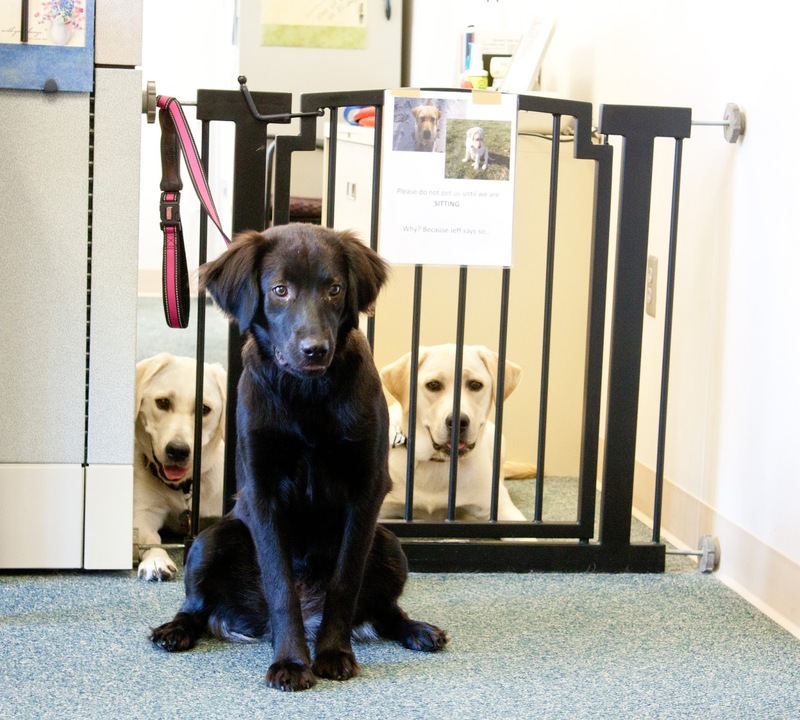 It's our friendly office canines that get the warmth of the spotlight in first minute of this video. Watch for the mighty Micron, Euka II, Scarlet and Rhoda here. Scarlet is the lovely pooch catching a treat from mid-air, Rhoda is the black lab getting some good air time with one of my co-workers. As the camera pans from my obnoxious blouse to Euka in a Bed command under my desk, hit the pause to catch those rockin' Labrador flip flops. My only saving grace here is the pedicure is fresh (color: Paint My Moji-toes Red). When the reporter is walking with a dog on leash, that's our Micron. No, watch that again. I really need you to see this. Because he's walking on a loose leash with a person he just met. Micron is. Heh, who knew he could do that? My sweet, impulsive Hodor dog. I was right behind the camera guy lest my dog saw a favorite person**** and wanted to say Hi! because he would surely drag that slip of a nice lady down the aisle with him. Oh, whoops, see his attention shift there for a second? Yep, he sees Scarlet, who has the best toys ever. But check it out, y'all. Micron holds that Heel position like a pro. It's like he was trained to do this. For the last three years. And do feel free to look away when Micron tries to slip tongue during that excited greeting with one of his favorites. *** That's a rather intimate moment, y'all. * The Lord of the Rings: The Fellowship of the Ring (2001). Bilbo Baggins: I don't know half of you half as well as I should like, and I like less than half of you half as well as you deserve. ***You know what they say . . . clutter is a sign of genius. I forgot who said that originally. I had it printed out somewhere, but lost it.